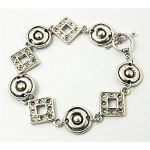 1960s Mod Style bracelet made of alternating bullseye swirl and diamond-shaped beads with a toggle clasp. Dimensions: 7 2/3" long. 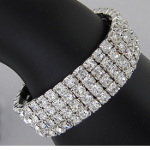 Elegant stretch bracelet made of four rows of Tiffany-set clear rhinestones. Dimensions: 2" internal diameter. 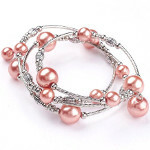 Made with steel memory wire, these bracelets can be wrapped around any wrist. 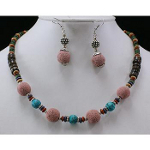 Accented with Dalmation Jasper faceted gemstone beads and tube beads. 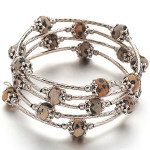 Made with steel memory wire, these bracelets can be wrapped around any wrist. 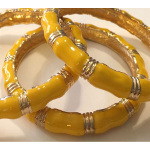 Accented with faceted glass in various colors and tube beads. 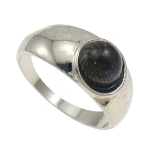 Silver tone ring featuring an all-seeing eye that changes colors with mood. 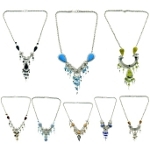 Dimensions: Mixed sizes 5 to 10. 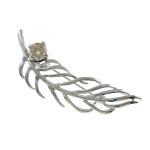 Silver tone pin brooch featuring three iridescent Aurora Borealis rhinestone clusters and pink rhinestone spacers. Dimensions: 1 7/8" long. 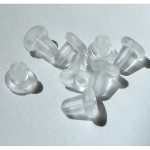 Basic rubber ear nuts for earrings. Price is per 1 pair. Black velvet jewelry bags with draw-string tops. 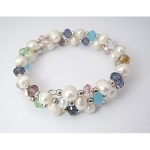 Dimensions: 2 3/4" x 3 1/2" long. 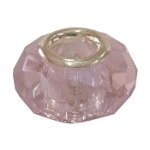 Bright brass dangle earrings featuring a circle accent with faceted Pink Crystal drop. An elegant pair! Dimensions: 1" long. Bright silver tone, silhouette earrings of a cat with curled tail. Dimensions: 2 1/4" long.